Remember that playground game Capture the Flag? Well Today’s therapy idea is based losely on that! 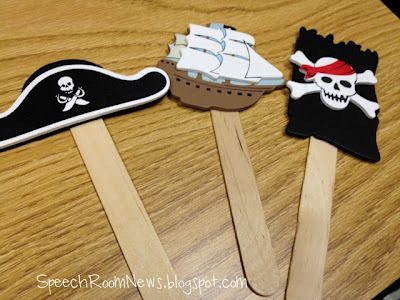 When I pulled out my pirate hats to play in preschool last week, I found these wooden pirate icons that I got in a craft store last year. I remember that I got them for something like 25 cents last year and threw them in my bin. When I saw them this year I had a quick and easy idea for them. Introducing Capture the Jolly Roger. Pirate lingo is cool and fun. Pirate lingo is way better than regular English. Pirate lingo also has many /r/’s in it! (By the way – Jolly Roger means PIRATE FLAG!) Ahoy, matey. Ready to make this quick game? Grab your popsicle sticks. I have all the colors except yellow because I used a lifetime supply of yellow ones for my French Fry Articulation activity! The next part is fun. Write down as many pirate saying with /r/’s as possible. If you need some help try HERE or HERE. I added the wooden cutouts to bigger wooden sticks. If you can’t find pirate icons, you could print some out and laminate them. I made 2 sets of these, one for each team. Next take some more small sticks and make them the LOSE cards. Attempt to draw a skull and bones like I did. 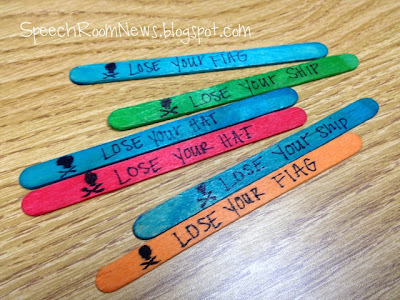 You will need 2 sticks each for your symbols, so I used flag, hat and ship. Now just add those materials into some repurposed soup cans. The goal of the game is to capture all 3 pieces from the other team (including their Jolly Roger.) As each team draws and reads a pirate saying they are attempting to capture the other team’s icons. If they draw a pirate /r/ saying they read it aloud and have the other students imitate them (in their best pirate voice of course!) When they draw a LOSE card, they must give the other team that icon. At the end of the game, the team with the most icons is the winner. Try to capture all 3 pieces! Any pirates looting your therapy rooms? I love this! 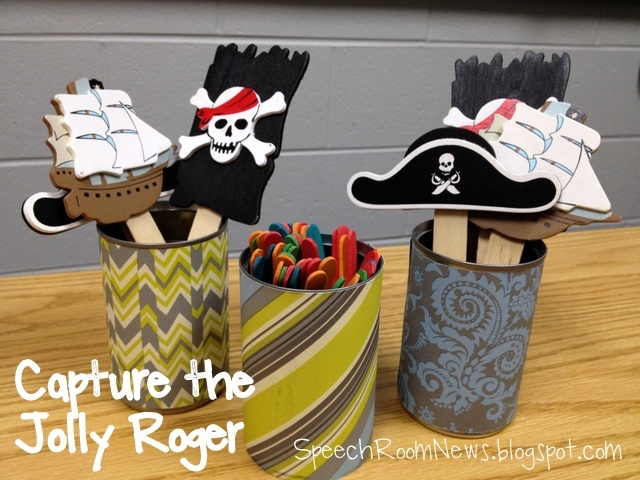 Let’s Talk SLP is working on some pirate-themed activities, too! This is just great! Thanks Brea! Looking forward to your ideas! Fantastic idea! I love pirates! Thanks for sharing your creativity! They aren’t cards- they are wooden icons I got at Michaels. Thanks for commenting! Thanks for your ideas! This is so creative. I plan to have Pirate week after Easter break and can’t wait to play this game. Thanks Jenna for all your wonderful ideas. I’ve been practicing speech-language therapy for 15 years and your blog with all the super ideas has really invigorated me. I’m loving the pirate theme and plan to use many of your ideas. 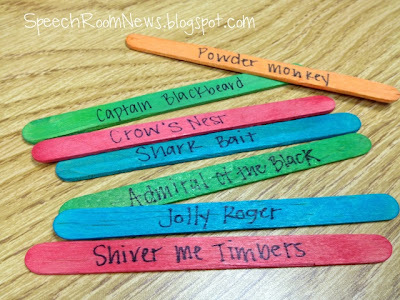 I am making the Capture the Jolly Roger game and was wondering how many pirate saying sticks you made for the game. I’d say about 30 sticks. Enough to make the game last about 20 minutes! Thanks! You are so creative and generous with all your ideas! Thanks so much! actually, I have been using this media to teach in in nonformal education and now I plan to use it as my thesis but I find it difficult to find the sourcess (books, journals, etc). could you help me with this. thanks….